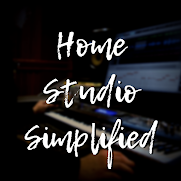 Home Studio Simplified: What Drives You? It is a simple question but the answer will keep you focused on what matters most. few chords? What urge dictates to you that you want to finish that mix? For most it can be easily answered in a few seconds, for others they may really think about it for awhile. But I can almost guarantee that the same conclusion will be reached, directly or indirectly. It is for the sake of creativity, and the love of music! drain you of happiness and you are getting burned out. It is OK to take a break, but don’t linger there, the longer you procrastinate the easier it gets to just simply say, “Awwww forget it”.